A DVD designed specifically for patients in alcohol and drug addiction rehab! Given the chronicity of addiction and the temporary nature of formal treatment, it is essential that clients learn how to maintain recovery after discharge from rehab. Additionally, many people needing treatment are not able to access such rehab and don’t know where to turn. This DVD address both of these issues. After briefly discussing the disease model and identifying the common symptoms of addiction, this DVD provides simple and specific instructions on how to utilize 12-step programs in building and maintaining long-term addiction recovery. Viewers are also aided in leaping any hurdles of resistance by addressing the common myths and difficulties about utilizing such programs. Most drug addiction rehab DVD’s address separately what Ingredients for Recovery addresses in one DVD. It is very important that addiction rehab DVD’s are engaging enough to hold the attention of patients. Bob’s DVD’s do just that. His enthusiastic and engaging style draws viewers in and keeps their attention by teaching the information and providing real life example viewers can relate to. This practical application component keeps their attention while showing them how to use the information they are learning in their daily living – an approach not often found in addiction recovery DVD’s. This DVD is a must-have for any addiction rehab library! Sober since 1988 and working in alcohol and drug addiction recovery since 1990, Bob operates an addiction private practice, is a drug addiction rehab consultant, and teaches at Loyola Marymount University (LMU) Extension. He is also Past President of the California Association of Alcoholism and Drug Abuse Counselors (CAADAC) and author of the EVVY Award-winning book: Enough Already! : A Guide to Recovery from Alcohol and Drug Addiction. 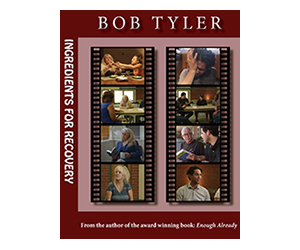 Ingredients for Recovery is one of many addiction recovery DVD’s Bob has produced. Check the DVD’s tab at the top of the website to view Bob’s other titles.